Fabricio Werdum notched another impressive victory in his MMA career on Saturday night, when the interim heavyweight champ out-struck, out-grappled, and eventually submitted heavyweight champ Cain Velasquez. The fight went into the third round, where Werdum was gaining momentum with every jab, knee, and elbow thrown, while Velasquez appeared to be sucking wind by the end of round one. Going into UFC 188, Werdum was ranked #14 in the pound-for-pound UFC rankings. With his stellar performance and pure dominance over Velasquez (who was ranked number four in the listing, Werdum’s stock will only skyrocket that much higher. What made Werdum’s performance so impressive was his striking. Werdum has always been a master and a threat on the ground with his Jiu Jitsu skills. Within the past few years, Werdum’s striking has immensely improved (by leaps and bounds if you look back at his fight against Andrei Arlovski at UFC 70). Werdum has transitioned into a full threat, a true elite mixed martial artist. He is dangerous on the ground, his striking is now top-notch, and his cardio is strong. The list of achievements for Werdum are impressive and hall of fame worthy. He is now the first ever to not only submit Fedor Emelianenko, but also Cain Velasquez, who was never submitted in his 14-fight career. To add onto his resume, Werdum has also submitted Antonio Rodrigo Nogueira and TKO Mark Hunt. Werdum’s winning streak now extends to six straight, his last loss coming in 2011 to Alistair Overeem via decision. 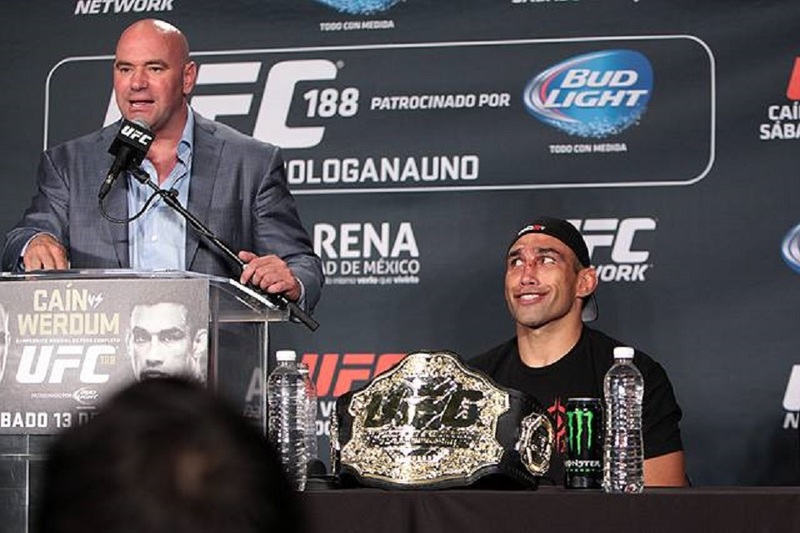 With Werdum the new “reigning” heavyweight champion, Dana White has many possibilities for main event battles. A rematch against Junior Dos Santos would spark interest, as the first time they fought in 2008, Dos Santos stopped Werdum with strikes in the first round. The rematch would be very interesting, as previously mentioned, Werdum’s striking is on another level now, and it would be interesting to see how the stand up game would go. Another threat could be Stipe Miocic, who is another top striker and the number three-ranked heavyweight. A rematch with Arlovski would also be interesting for the same reasons as the Dos Santos rematch. Finally, Velasquez will not just “hang them up” just because he lost his title, Cain will surely be sticking around, and a rematch is foreseeable in the future.